Notes: Part of being a responsible blogger is being honest. Exaclair was nice enough to supply me with this bottle of J. Herbin, and I couldn’t be more appreciative. Keep in mind that this does not change my opinion of the ink, I stand by my review. I feel like I’m drowning in green inks. Is this a bad thing? I don’t think so. Before receiving a bottle of this ink, I had purchased a sample a while back and remembered enjoying it quite a bit. I can say that I was happy when I got the bottle. Vert Empire isn’t your brightest green, which is a nice thing. It’s not quite as dark as Diamine Evergreen, but has some of the same tones going on. 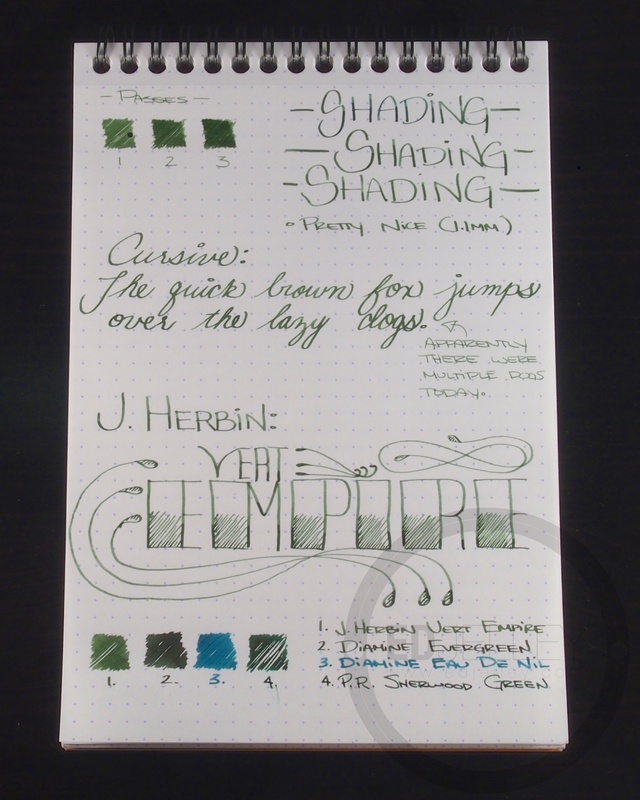 The ink shades pretty nicely and as far as medium-dark green go, this one’s a winner. As with all of my experiences with J. Herbin, the ink performs well, cleans out nicely (okay, Rouge Hematite doesn’t clean out too easily, but it’s totally worth using), and is an all around good ink. 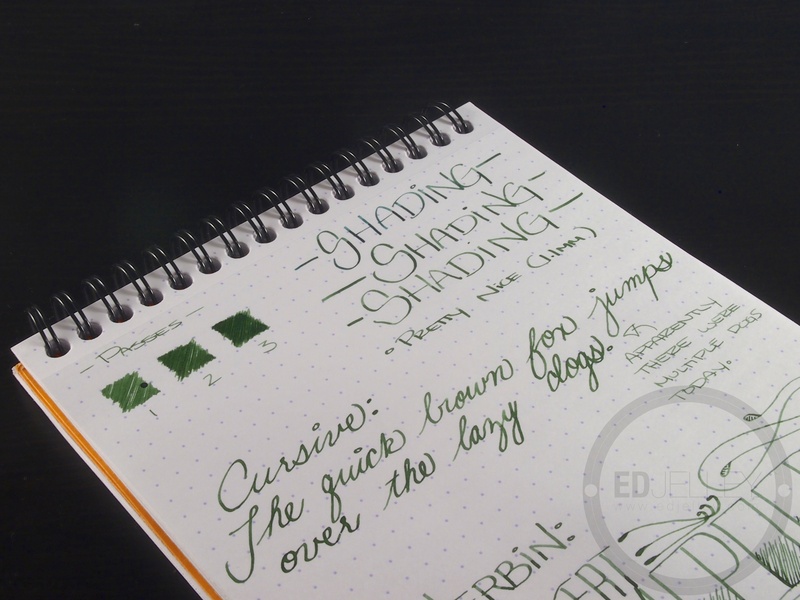 The shade of green isn’t too crazy, and you can probably get away with it in more formal situations, but it can be a bit light on the page with a finer nib. 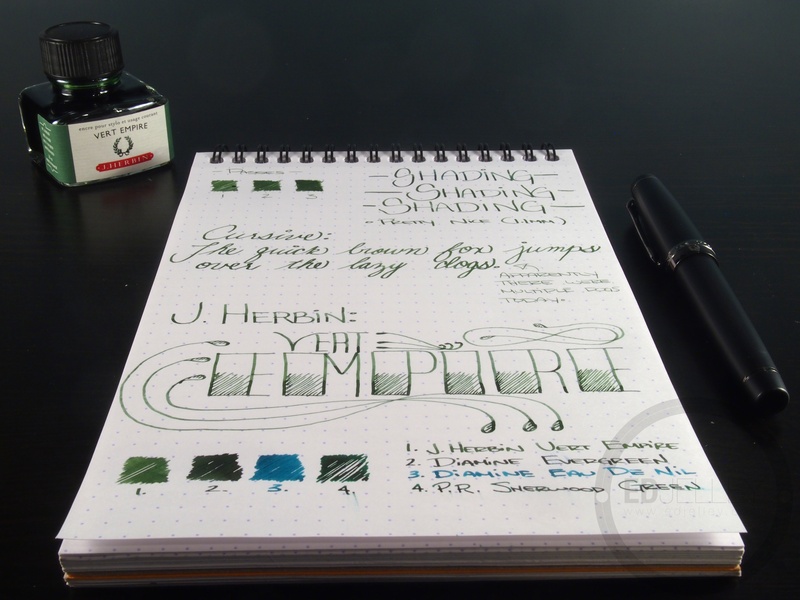 The only thing that leaves something to be desired is the shape of J. Herbin’s small bottles. While I like the shape and the aesthetics of the bottle, function usually wins out over form. They can be a bit hard to fill when the ink level gets low, but hey, that’s what they sell syringes for. 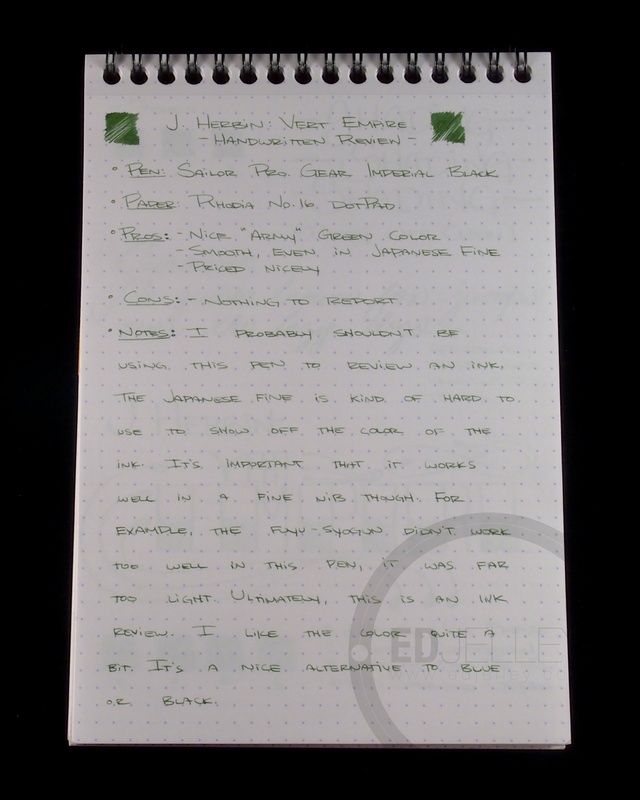 Enjoy the pictures, and check out Exaclair for all your J. Herbin, Rhodia, and Clairefontaine needs. Some pretty nice shading from this one, I need to check it out in a flex nib. The Vert Empire builds up on the page nicely. It’s easily darkened with a few passes of the nib. 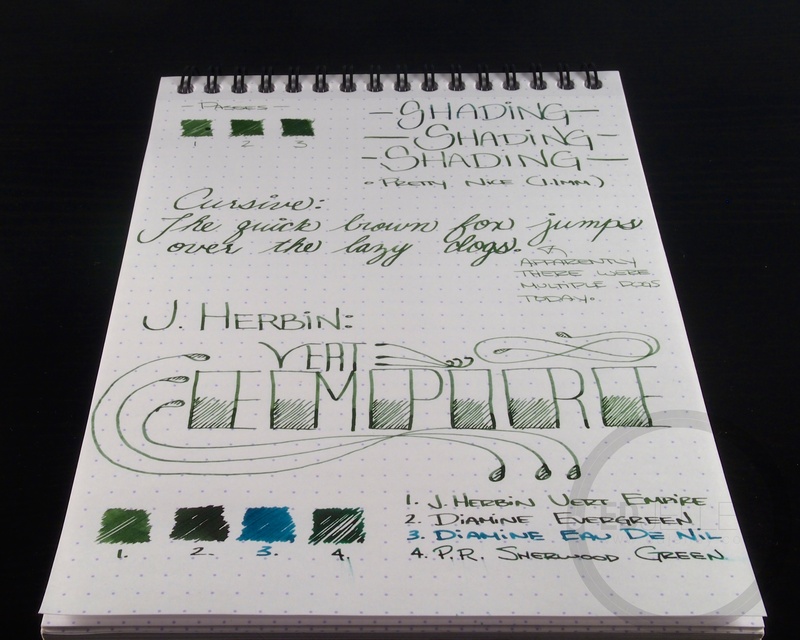 A bit lighter than Diamine Evergreen and Private Reserve Sherwood Green. A Friendly Reminder about the Trading Post! Excellent review, and I’m right along side you on pretty much all points. 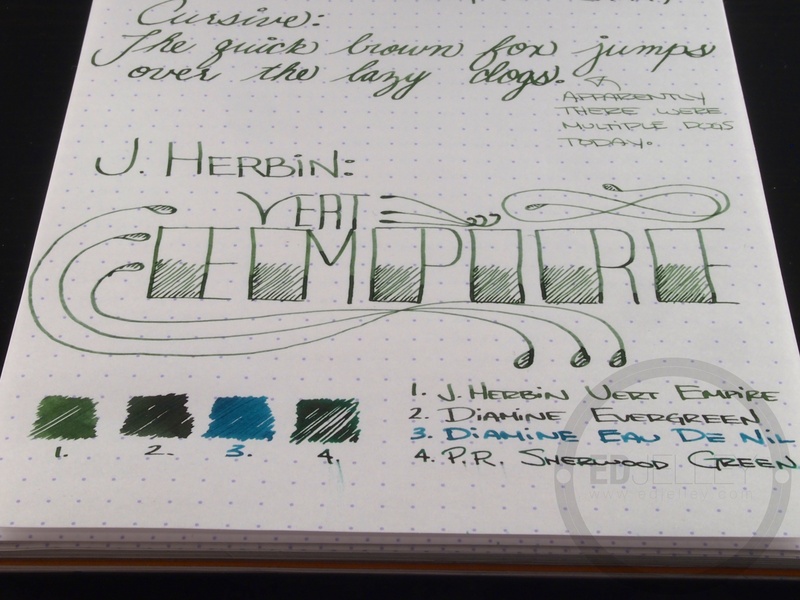 Vert Empire is the first green that made me realize that I actually prefer green inks to blues. Something I find interesting about it is it’s changeable nature; depending on dampness of pen and the sort of paper, it can show as anything from a pale gray to nearly as dark green as Mont Blanc Racing Green. Lovely stuff, especially if you’ve got a better bottle to tip it into. Thank you! I usually keep a green inked, along with a black and some blues. 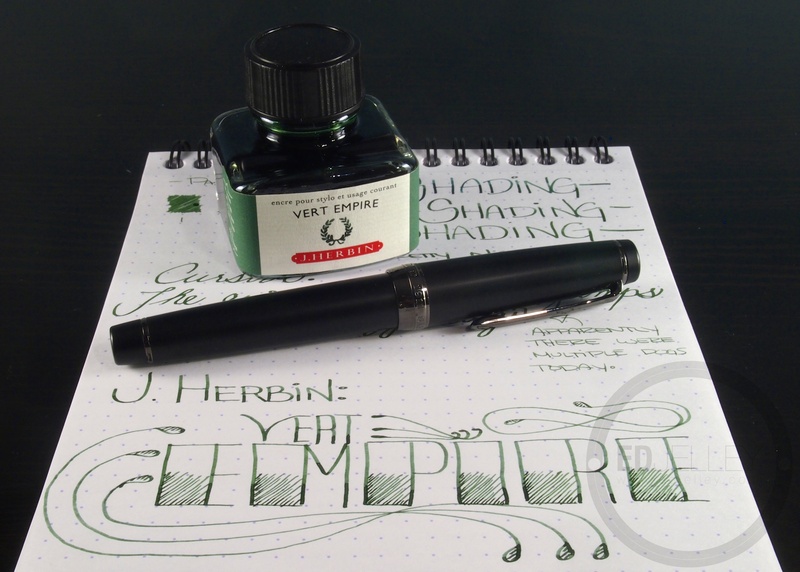 Vert Empire is pretty versatile, and an all around good ink. It does vary quite a bit, in my pictures you can see a pretty big difference between the Lamy 1.1 and the Sailor fine. Thanks for reading! Uh oh. Yet another ink I don’t have but now I’m like “oh.. that’s pretty.. I want!” Well, thank you. Haha. Great review, of course! Thanks! I’ll trade you a lifetime supply for that Conid! Totally fair trade. Also, maybe sample exchange? Email me! While admiring your great cursive Ed, I began to wonder about the origin of “The quick brown fox…”. Aeons ago I believe we used it in typing class, but it is just as useful to impart correct letter formation in handwriting. The phrase sounds proverbial, or like something out of Aesop or an old school primer. Sorry for the derail (I have a sample of Vert Empire–it really is a lovely ink), but that phrase is as beautifully, poetically odd as it is utilitarian. The quick brown fox is definitely better than “Amazingly few discotheques provide jukeboxes.” It gets the job done without making me look like a total weirdo. Pingback: Just another pen ? !Blick über den Tellerrand vom 6.  April 2013 » Just another pen ?! Thanks for reviewing this ink. I have a bottle that I tried once in a too-fine nib (early on in my fountain pen experience) and shoved back in my ink cabinet. Think I’ll get my little bottle of Vert Empire out and try it in a stub and see what happens. Lately I’ve been revisiting quite a few inks that I originally decided were pretty uninteresting (Eau de Nil, for one) only to find out that now I really like them. I’ve found that my taste in ink has evolved along with my taste in fountain pens, so revisiting previously discarded inks (and pens) is a fun activity for me now. OK; so, I’m easily amused!